This article is 3248 days old. 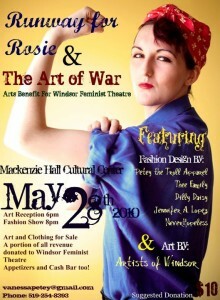 Petey the Troll Apparel, Europe-travelling Dilly Daisy Designs and fashion items by many other Windsor-area seamstresses will be exhibited on a runway tonight during “Runway for Rosie & The Art of War”. 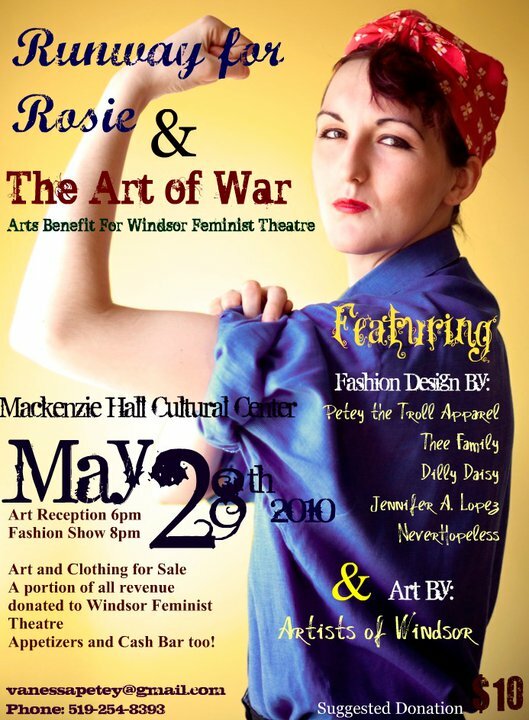 The Windsor Feminist Theatre is putting on a fashion show to benefit its art programs at Mackenzie Hall Cultural Centre in Sandwich town. The Art and Clothes sale begins with a reception at 6pm tonight, and is followed by a fashion show at 8pm. The suggested donation for entry is $10. Mackenzie Hall and Cultural Centre is located at the corner of Sandwich and Brock streets in West Windsor.